Sleep and death: it’s one of the great metaphors: up there with fire/desire and dove/love, only the rhyme doesn’t work so well. Having said that, tonight’s venue mines our metaphor as deeply as anywhere in the world. There’s the King’s Chamber of the Great Pyramid of Cheops, I suppose, or the tomb chamber of the Taj. But it’s a tight call. And unlike them, an overnight in the long barrow can be fitted in between putting the kids to sleep and a wake-me-up blog-drafting session in Swindon’s central branch of Starbucks. Now that’s death. Sleeping with your head where, for several thousand years there were piles of bones, is small beer compared to breakfast in Starbucks. No one knows how long this spot has been special, somewhere set apart. Certainly, long before they built the long barrow. Perhaps there was already a clearing here, among the trees of the wildwood, a place people had come to for centuries. Perhaps at some point they began to honour the dead in the middle of this opening: an ox-hide on a wooden frame; offerings. Perhaps the very age of this association made it a place linked to the past, with those who have gone before. Yet it’s unremarkable enough a spot; just a moment in a smooth rise, not quite at the top of the low hill. Parallel to the swift, cold river below that moves through the night like a snake. Parallel, too to the bleached Down above, distant and imperious, a high chalk reaper. But that could be said of much round here. Then, six thousand years ago (or so), they built this enormous thing here, piling up stones of such dead weight hardness it beggars belief, and then covering the result with a long, low spine of solid earth. They had made a house: a house grander than any that people actually lived in, and far more fixed; for these people were hunter-gatherers, who moved through the landscape in search of food. Once the long barrow had been constructed, it offered the dead of this community a more permanent home than any they had known in life. And in creating it, they invented Architecture. There is, quite simply, nothing older, these islands, at least: nothing permanent, man made, designed. 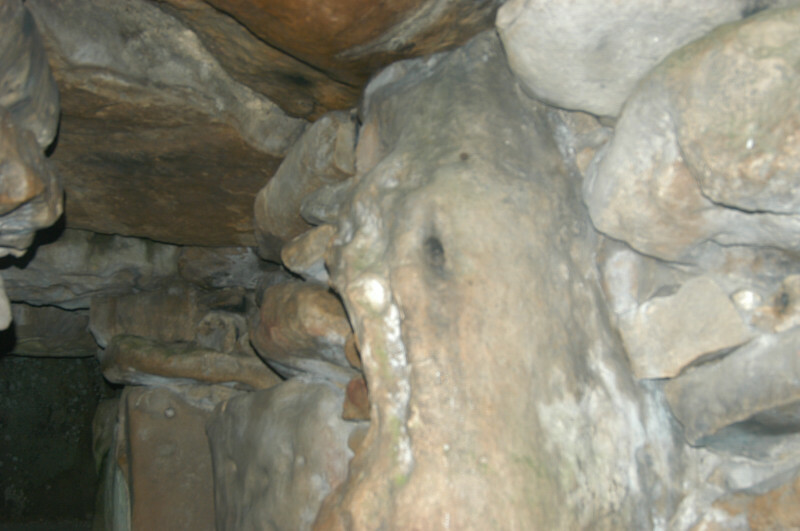 The long barrow has an interior: five rooms, arranged around a corridor. It has a façade: a sequence of colossal, bare rocks, rising and falling with the profile of the great earth mound; it has intention, inexplicability: for 80 of its 100 metres it tails away, without obvious function. Like all great buildings, then, it does something that doesn’t need to be done, but which is an important part of how we perceive it. It is architecture: it is First Architecture. And then they filled their house of stone with bones. A few people for each generation, people set apart in some way, from a culture which returned and repeated their internments here for centuries. And at the same time they came back, and back, sorting and re-sorting the piles of bones, tenderly, obsessively shifting them from one bedroom to another; bones of the young in one room, the old in another; many skulls and longbones removed, others kept. Some think there were two stages to the process: dead bodies left to clean and decompose before being disarticulated, either outside, on platforms of wood above the long barrow, or in a special room of the barrow itself. The room I’m going to sleep in. And then finally, at the end of a millennium of such use, a climactic change took place. They brought a few of the mightiest stones imaginable, and blocked off the house of bones, making it both more memorable and more closed. A First Façade for the First Architecture. And there the bones lay. Mighty structures – colossal circles of timber and stone, man-made mountains – came to the valleys nearby, then fell into disuse; invaders swept through the country, more than once; someone invented civilisation: writing, property, law, the Church, cities, factories, everything; and throughout the millennia, countless dead, countless memories, countless grieving people, filling the round barrows, the pyres, the churchyards, the crypts and finally the crematoria. For most of this time, no one knows what people made of this man made long green hill on top of natural one. And then, in 1955, Stuart Piggot came along with a band of diggers, and with a care not seen since the bones were first laid to rest, took them all out again, and classified and resorted them once again; undid the careful curation of the ancestors, and left the empty architecture uninhabited, awaiting a couple of generations of gaping visitors: tourists, hippies, heritage-spotters, and a now a pair of Adventurers Close to Home. It’s a cold night. The ground is hard; crystalline piles of ice sit in the furrows and against the edges of the path. Cold, and clear: reached across freezing fields left fallow, the massive profile of the First Façade and the low, battered ridge of the First Architecture skyline against a shattered mass of stars, hard, hot, distant and focused. The sarsens are more enormous, the pitted tail longer, the sky more colossal, than they are by day. The wind is firm and cutting, severing the senses. Have we done the right thing? My wife didn’t think so. She feared I would return dusted with some Neolithicpharaohic curse, here on the cusp of the new moon, at the turning point between my year and hers. We stand on the top of this earth-mountain; we lie against the stubble and stare up into the bottomless black bowl, potsherds of the heavens. And then we go in. Immediately inside, the air stilled, and the temperature rose by several degrees. The chill left the air completely. And the air was sweet with incense-sticks, and with the soft honey-scent of roses, left for us in every stone bed-chamber, soft, deeply coloured, alive, inseted into the colossal sarsen walls. Danny chose the inner right room, the one with the red roses, one of those where Piggot found mixed bones of the young and the old. I choose the master bedroom, the Main Chamber, where the only bones were male, and included one articulated skeleton; perhaps it had been left to rot to clean whiteness and forgetting, before it too was to be cycle and recycled through the sleeping-halls of death. The nightlight made shadows dance on left the rippling passage walls. Seen from outside the rough rectangle of warmth was an inviting prospect.. Distant artics topping the brow at Overton made belisha-flickers on the façade. The first few hours were easy, but even this was not the homely sleep I had begun to hope for. A consciousness lurked beneath the slumber, crushed at first by the weight of tiredness, but shifting from time to time into the parts of sleep that know they are there. Dark disorientation: am I facing a wall of sarsen or a corridor open to the bleak air? A shifting, uncertain sense of the extraordinary, too half-dreamt to be properly named. 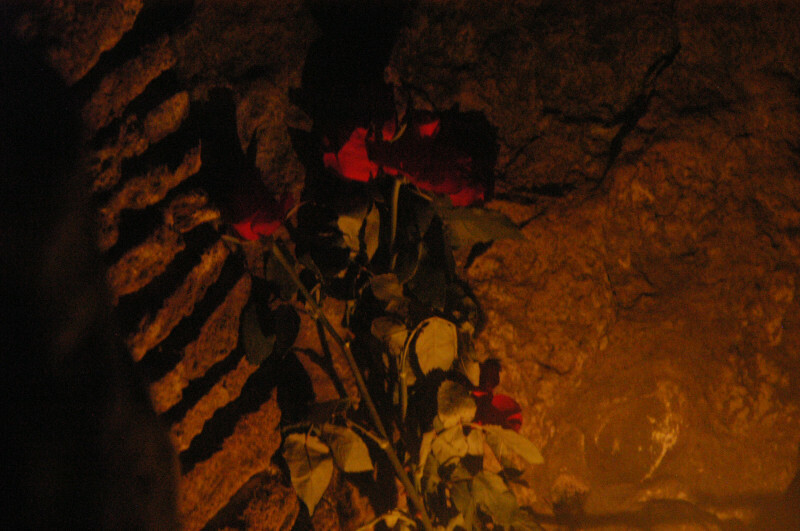 At the time, the perception that there was astonishing, heart-breaking love and care about the longbarrow felt like the big discovery gained by sleeping here: but in retrospect it is this, something darker, shifting to a kind of wakefulness in the heart of those enclosing, ancient, stones, that is the sensation that lingers most. Perhaps that is a little what death is like. 3am: I lit the candle, drifted in and out of sight. Now I could see clearly in my surrounding how they made this place. The plan was laid out first, in massive sarsens set in the earth, its circles and corridors very much like prehistoric stone settings. Then they began to pile earth up against them, and lifted stones onto it so they piled up and filled the gaps between those that stood in the earth. Gradually, and in an improvised, stone-by-stone way, these were corbelled outwards. And the earth was piled up further, until the most colossal rocks could be brought, great flat things to bridge the gap and make a roof. And in the meantime, someone brought something special: perfectly split tiles of limestone, from perhaps 30 miles away, to be laid into every gap with delicacy and craftsmanship that. 4am: the A4 is never silent: every lone lorry, late reveller and night worker can be heard working their way along the tarmac strip, from halfway to Marlborough to halfway to Calne, the sound funnelled into our pipe-dream of stone. More than that, I am sleeping in a tomb, its wide mouth open to the elements, roofed over by things that would crush me in an instant, things that are held in place only by their own gravity: by a force forever pushing them downwards, and towards me. Why is one of the roofing-stones missing, and what has happened to it? The concrete-and-glass Ministry of Works ceiling that replaced it gives the longbarrow something of the aesthetic of the 1960s public loo. 4.30am: Where are the foxes, the deer, the voles and hedgehogs that I know to fill this landscape? What do they know that I don’t? That articulated skeleton, ancient archaeologist, mocking as he rots: and then memory. Of being an archaeologist myself, a sorter of bones, an honourer of ancestors. Of Stumbling on a medieval pilgrim in a ruined cottage on a Welsh island; of finding his toe first; of the deep intimacy of being the first person to touch this toe since his wife or child, centuries ago. Death is the deepest intimacy of all. They knew its horribleness, and things it does to bodies, in ways that we don’t. They knew real fear instead: but they also knew real love, for a force as sure and worthy as any other natural appetite. They included death, accorded its residence a grandeur and fixity they never knew in life. They were in community with it. 5am: this hill is made of bone: of millennia of calcium, tiny crustaceans piling on the airless seafloor, lifted up and eroded. I am made of bones. There is something about death and stone: the complete unconsciousness of the truly mineral, this is the stuff that most of the universe is made of; and to think we think it alive. Stones and bones: I’m groping my way back to crass metaphors and easy rhymes: not a good sign. 7am: a walk across the concrete-hard field to Swallowhead, where we drink water fresh, warm, thick with mineral; calcium water, a solution of earth and bone, of oblivion and soil, of the inexplicable continuity of complete death and burgeoning fertility. 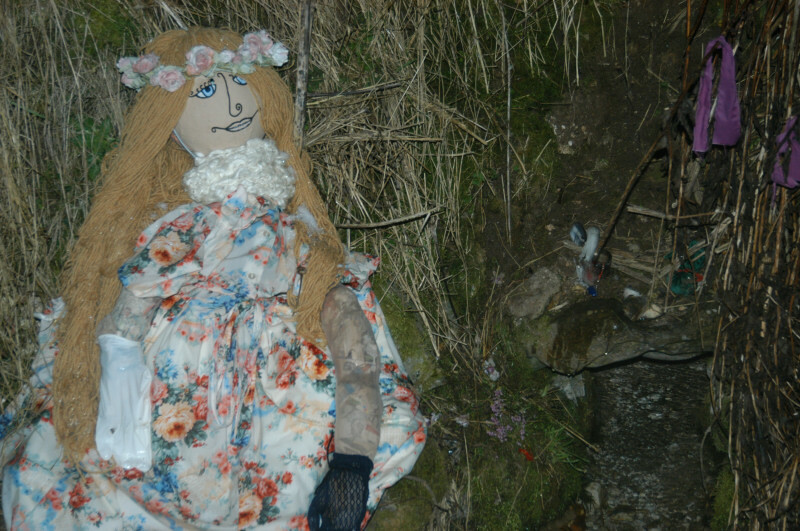 And someone has left a lifesize doll of a little girl by the Kennet spring. And I realise I was wrong, this obvious-as-hell metaphor does rhyme: womb/tomb. This occasional investigation is my friend Danny’s Big Idea, so it seems appropriate that he (with some help) built its first subject. It’s also a salutary reminder that the Sleep Project – about travelling places by sleeping in them; about the unique intensity and intimacy of places at night and unconscious, and about the mysteries of sleep itself – has a serious side. After all, some people don’t get to sleep out by choice; some people die doing what for us is an indulgence. A dirt cheap holiday, then, in other people’s misery; as well as other people’s poetry. It’s also an Adventure Close to Home. To have a full day in London, cycling from Paddington to Holborn and back in a snowstorm; have time to go home, have supper and put the kids to bed; and to still get to sleep in a cave of ice: that is about as adventure-close-to-homey as one can get. The discovery of night that is one crucial element of the project began as I followed the footpath from Danny’s house. Immediately, it was clear that snow at night has special qualities. It is luminous. Even in the thick mizzle that marks the dawning of a thaw, this blanketing of whiteness reflects and receives enough white to make it possible to walk without a torch; though without an occasional flash to pick up other peoples’ footsteps, one would soon be helplessly lost, even in a small wood like this. Branches are an infinite maze of variations, without a single landmark to orientate the eye; gaps between bushes indistinguishable from actual routes of paths, masked by identical mounded white burdens. And as the wood falls away and you enter the nearby field – a shallow dry valley in the dip slope of a clay-with-flints covered Down – one encounters a different kind of disorientation. I know this to be a large field fringed with trees and the sky above; but in this light it is Rothko-gone-tonal, an infinite depthless off-white merging into an infinite depthless darker-off-white merging into an infinite depthless near-black. At all times of course, even in daylight, this tonality is the great visual gift snow gives to landscapes. Colours stand out, sore thumbs in a world rendered off-black and off-white. Even the soft shades of grey and brown, of bark, or the feathers on a pigeon’s back – are rendered deeper, more variegated by it; this is partly because everything is covered with nature’s non-colour, white; and partly because everything reflects off everything else, and is to boot crystalline with ice. All this, snow does, and all this it does uniquely. Yet in other ways it is ‘like’ other things, and some of them unexpected: the mounded, duning piles of tiny specks are ‘like’ sand; though it strikes me that, while this seems an unlikely contrast, the reasons for it being so are cultural ones. Surely it’s only since the dawn of flight that we’ve associated sand only with hot places. Surely medieval people, for example, only encountered it at the sea edge, where, just like snow, it was cold, and shot through with the dangers of being near dangerous natural forces, and intimately associated with water. And – and this is relevant to the bedrock of tonight – it is ‘like’ chalk, not only in that it gives the landscape the unexpected, unnatural, bleached-out non-colour that is white, but also because the combination of smoothness and whiteness does something similar to our expectations. Chalk hills, even with their thin patina of grass, distort space; they seem larger, more expansive, than they really are; and walking in them thus gives an illusion of moving faster than usual, of moonwalking. And both chalk and snow store up water, giving an illusion of dryness to world that, Winterbourne, can suddenly turn to river. And now here’s the igloo itself: a mammoth-shaped thing on the field-edge, with a crawl-in gaping entrance shielded only by thick blue and white rug. A snifter of Laphroiag-and-ginger wine and I’m in. It’s a cold womb in here, its edge undulated by the hands that packed it out, enclosing without particularly sheltering, instead bringing the frozen landscape into sensurround closeness. And it’s strong: you could sit on it without it collapsing. But also, and here is my intimations of the hardships such experiences can bring, soft. There is just room to lie down, but if I lift my head or seek out something from a bag I am very likely to brush the walls, and each time I do, frozen specks fall down my neck or into my bag and immediately turn to cold wetness, precisely what one doesn’t want. Indeed unpacking is surprisingly hard; everything you want to stay dry has to be enclosed in plastic or somesuch, and doing this is quite slow given that you don’t want to imprison meltwater with them. Such things must be obvious the Arctic explorers and mountaineers, but they are easily overlooked to the Adventurer Close to Home. There are plenty of thin but insulating layers between me and the snow that is the ground’s lowest carpet; there’s also no real darkness. The self-reflecting world of faint greys penetrates in here as much as it does the fields and woods around me; if someone walks past with a torch it shines through my translucent cave like some unearthly, refracted spotlight through grisaille. In spite of this I fall asleep with surprising ease. Perhaps it’s the Laphroaig-and-Christmas-cake nightcap. But I awaken in the small hours. This is the time when elderly couples in unheated flats shuffle quietly and coldly off the mortal coil; it is the time when even ordinary campers are most likely to awaken with a jolt. One even wonders if there is not some body mechanism that triggers a moment of survival-instinct wakefulness just as the combination of the coldest, darkest reaches of the night and the slowest, lowest dip in the body’s own rhythms can otherwise spell the greatest potential danger. Yet it’s not a very clear-headed wakefulness. My perception of my situation comes slowly, slipping in and out of unconsciousness, and it takes a while, for which read seconds or perhaps hours, to analyse. At first I am just very aware of cold. It is emanating all around me; not the passive, almost cosy-coldness of a cold room and a warm bed, but a radiating cold coming from inches away from my body and pressing its energy upon me, like a radiator reversed. The contrast between my freezing face and my legs, which are so hot I have had to take my trousers down, is so great it is uncomfortable. And gradually I become aware of other things. There is a strip of coldness running thin and hard down one side of me, where the sleeping bag’s zip runs. I’ve not been aware of cold with such precision before. One of my feet has two layers of socks, the other does not; and the one that does not is getting that heavy pain of the unshakeable Cold Foot. Again, a certain precision of perception that perhaps goes with a body protesting at what is being done to it. I realise I am getting more, not less, uncomfortable. Hours, or perhaps seconds, later, I realise that one layer of sleeping bag has slipped off, and pull it back on again. This seems to be the root of the problem. Why did it take me so long to work that out? Something approaching comfort slowly returns. From then on, the sleep-pattern is typical of outdoor sleeping; one wakes more often than at home, and a bit of one is always ready to wake completely, halfaware of the occasional gaw and flap of a partridge, the footstep of some invisible mammal, frozen from its burrow or food-source (there is, I note, no dawn chorus). Yet one also seem to draw a unique kind of restedness, from the freshness of the air, the openness of the environment, the firmness of the ground; a kind of rest one never gets at home. One suspects that a hunter-gatherer would sleep more like a cat than we do, not imagining that nights should be unbroken by wakefulness or days unbroken by sleep. At some point, however, the final key to comfort is found: put you face beneath the cover of the sleeping bag. Not easy when you are as tall as me – the bag is not designed for such treatment – and entailing occasional discomfort, as breath is slower to draw in, which the body never likes; but snug-as-a-bug warm. And there is really no shortage of fresh air: Danny’s equivalent of my 3am survival call, which occurred a couple of nights ago, entailed a brief, and probably equally ill-thought out, concern for the shortage of fresh air in here. And this led to a midnight engineering trip with his fingers that punched neat little air holes in the roof. Thanks, Danny: the result may or may not be life-saving, but they presumably put paid for good to any attempt to test out the myth that igloos are warm. This one is (perhaps it always was) an inexhaustible fount of frozen air. I think I’m awake, but when there is footfall outside and a flask of tea and a bacon sarnie I realise I was dead to the world. The outside has lifted a few shades of grey; details have revealed themselves in the field, which has revealed itself to be tussocky and broken, but had still pixilated its way to unbroken whiteness in the ‘darkness’ of the previous light. I lie for a long time, watching the lightness shift on the crystal walls, listening to the frozen spaces. Then I leave for the school run, at once rested and sleepy from my first dose of the Sleep Project, and one thrilled by Adventures Close to Home.